I became a midwife in 1989 because the births of my first two children proved to me that giving birth is one of the most profoundly influential events in your life. The miraculous nature of birth and the power of women's bodies to give birth safely never fails to move me. I feel it is a privilege to offer my skills as a professional to accompany women, their partners and their babies on their journey of birth. I began my career in the NHS as a community midwife, specialising in water births and home births. I became an independent midwife in 1993 because I wanted to give women a different style of care to that provided by the NHS, such as remaining with you throughout labour, however long it may last; conducting as much of the care as possible in a relaxing environment (usually your home) and allowing you to take as much of a lead in your care as you want. I work in an equal partnership with you to make your birth as fulfilling as possible. I believe that having a baby should be as natural a process as possible and that if you are told the facts and allowed to relax throughout your pregnancy, a natural labour is much more likely. I have now attended over 100 homebirths since becoming an independent midwife, and around 350 births in total. I regularly attend a homebirth group as an advisor. 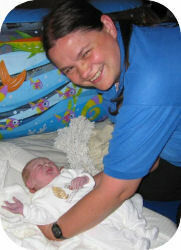 "I feel privileged to have had Sarah as my midwife for both my pregnancies. I have such powerful memories of the whole experience"
"Sarah was with me for the births of my two youngest children. Having my youngest child at home was the most empowering experience of my life. Sarah made me feel realxed and I enjoyed it and felt in control throughout"